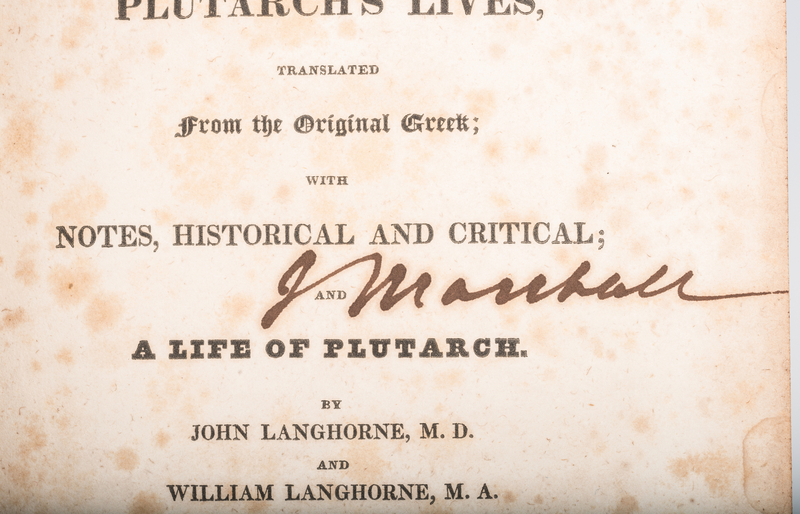 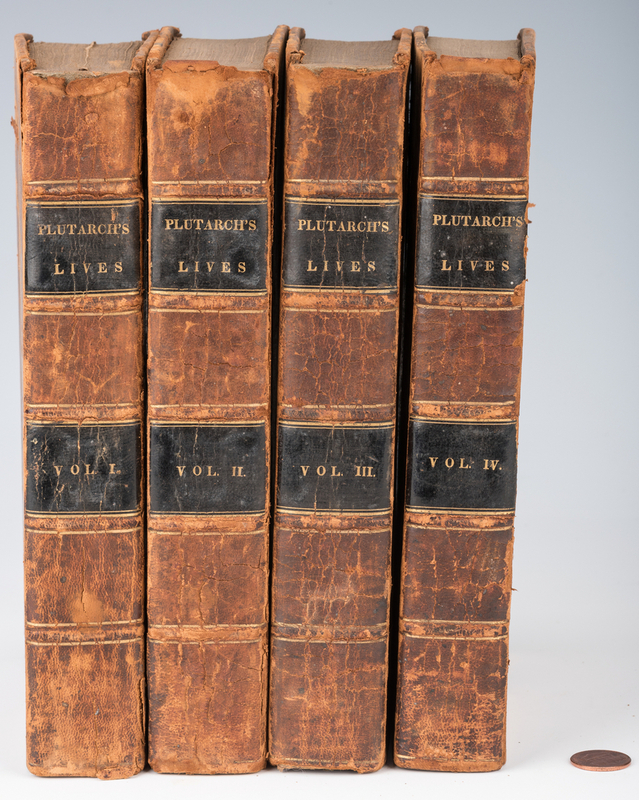 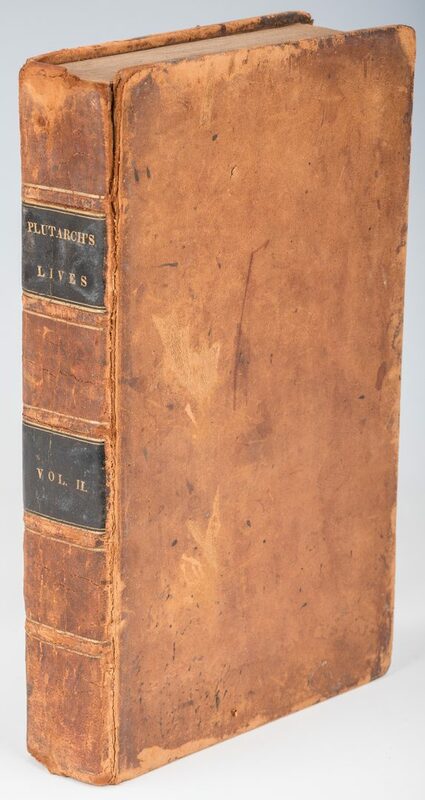 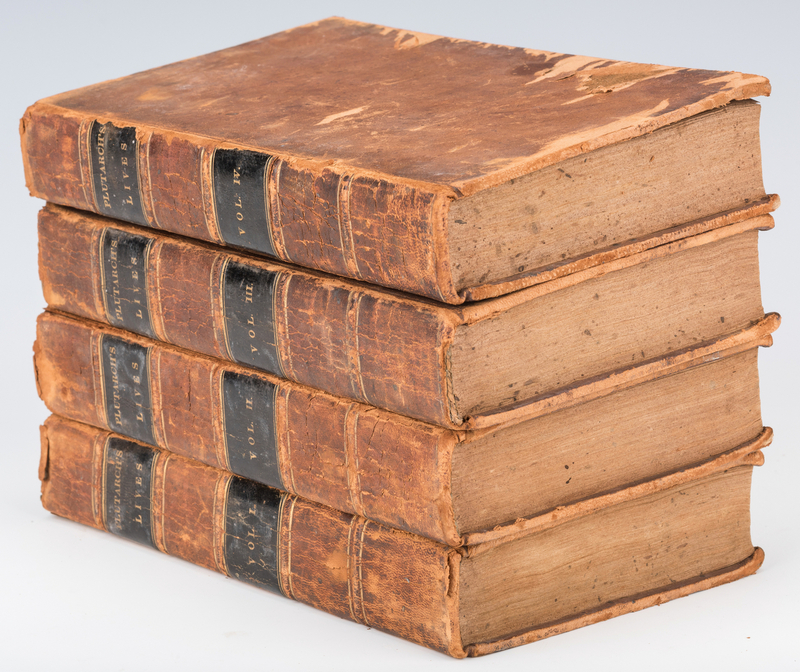 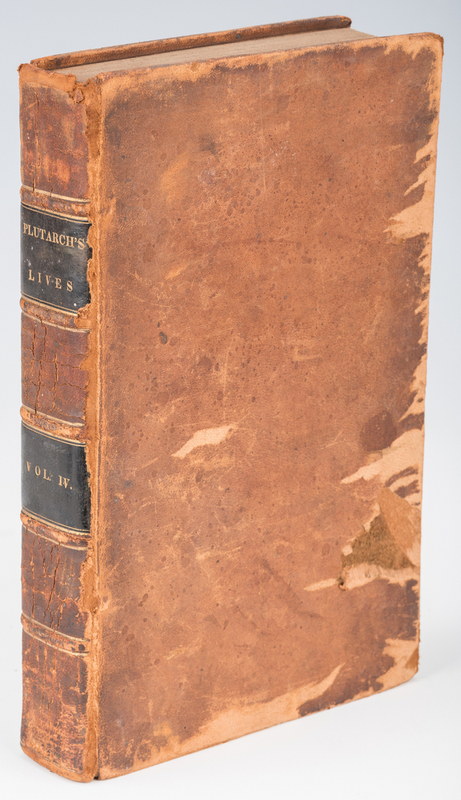 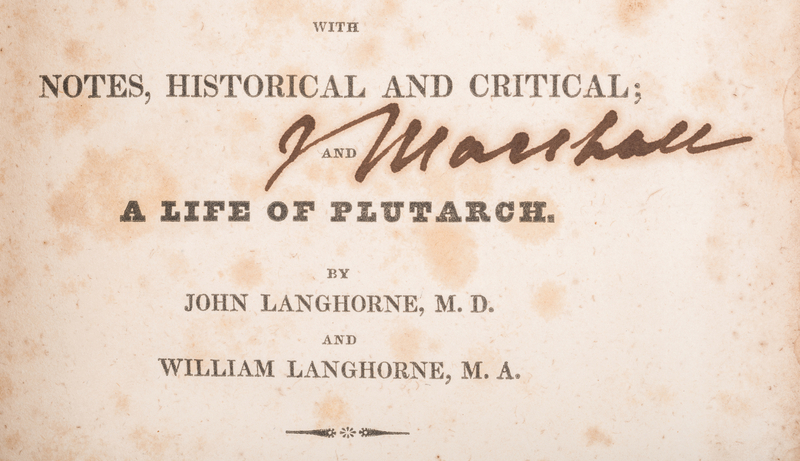 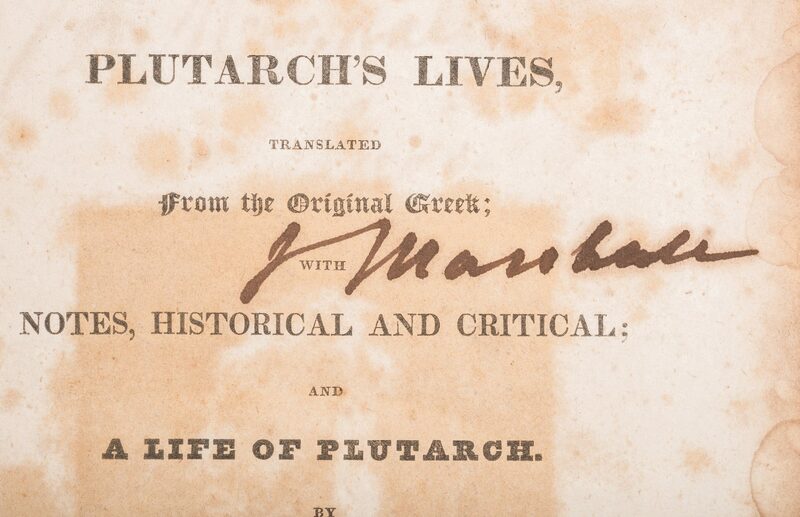 John Marshall signed, four (4) Volume Book Set: "Plutarch's Lives, Translated from the Original Greek, with Notes, Critical and Historical; and a Life of Plutarch" by John and William Langhorne, Carefully corrected and printed from the last London Edition, 4 volumes. Published James Crissy, Philadelphia, 1825. 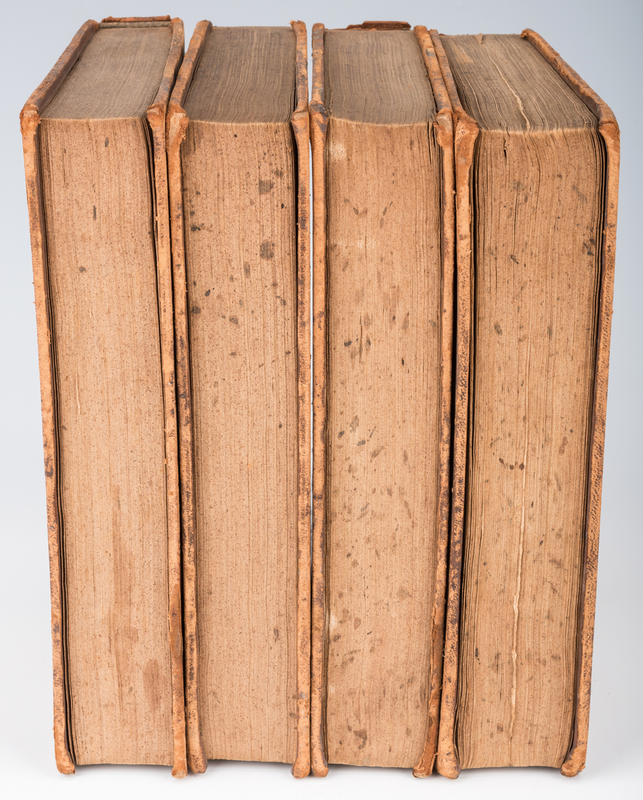 8vo, calf leather cover, and black leather spine labels. 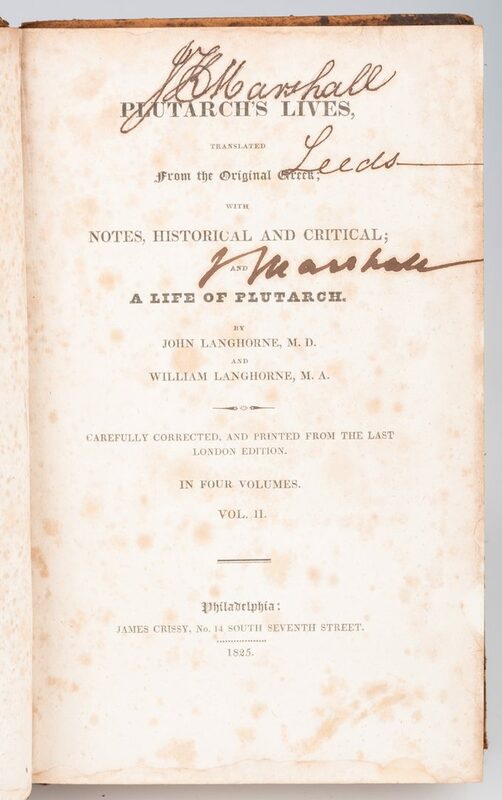 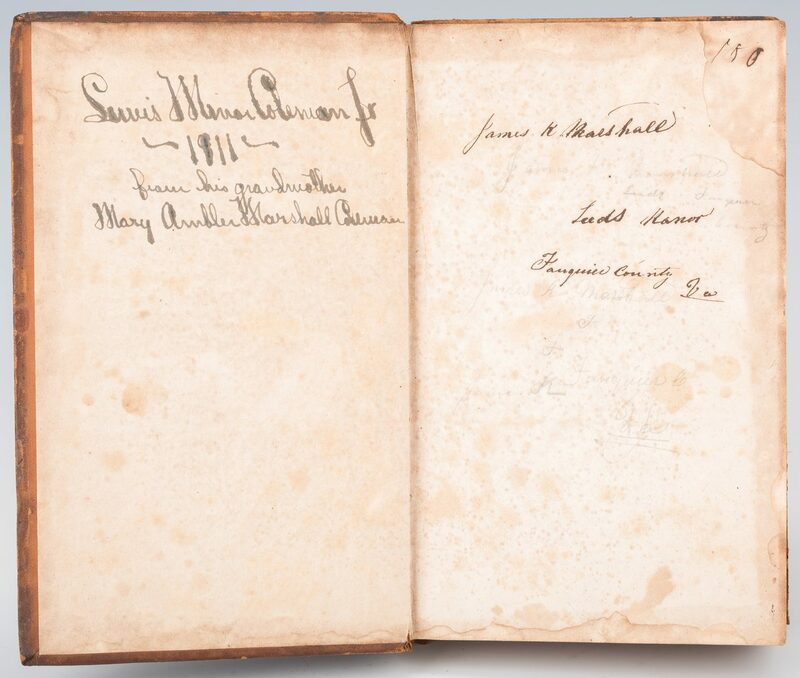 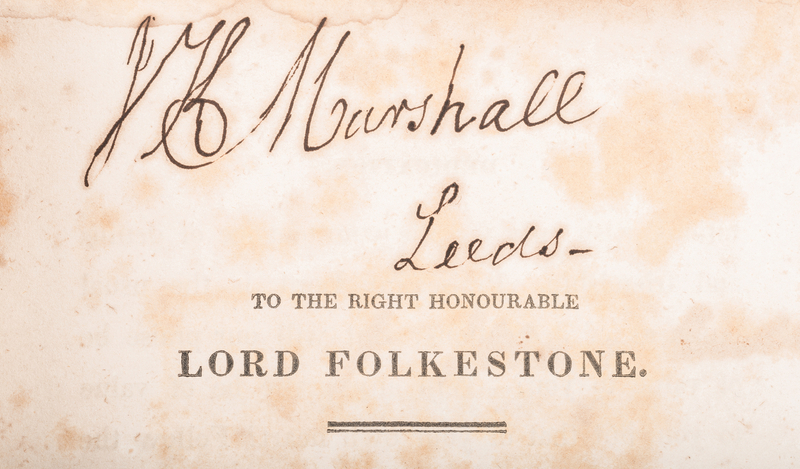 All volumes signed by original owner, Chief Justice John Marshall (1755-1846) on the title page. Additionally, each volume bears the inscription: "Lewis Minor Coleman, Jr. /1911/from his grandmother Mary Ambler Marshall Coleman" on the inside front cover. 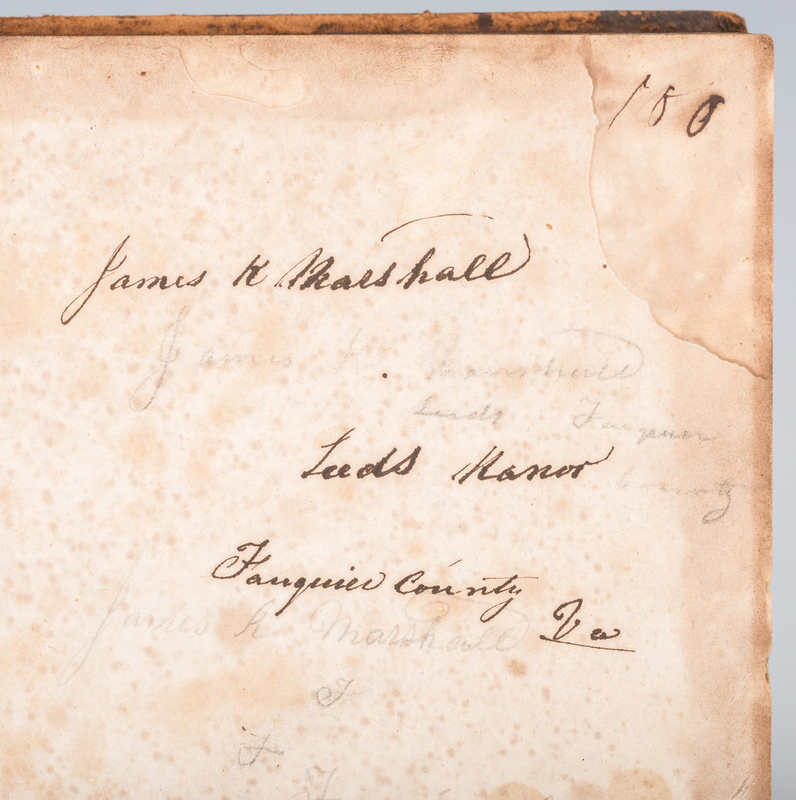 Volumes I, II and IV bear the additional signature of James K. Marshall, son of John Marshall. 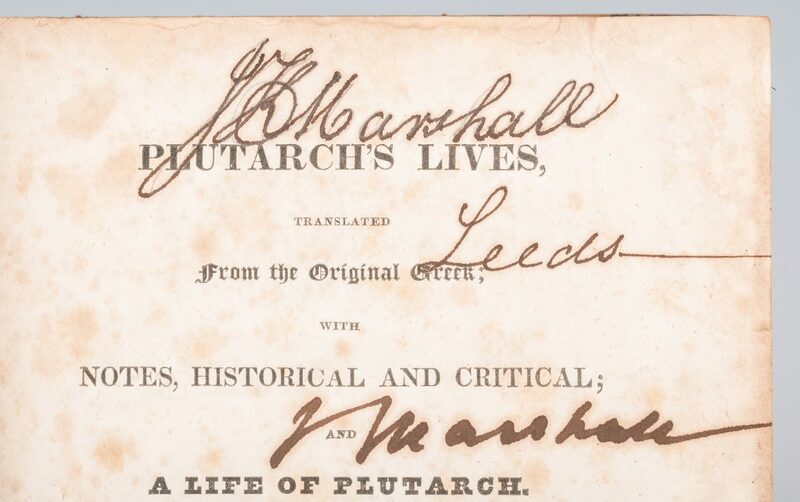 All four volumes are signed "J Marshall" on the title page. 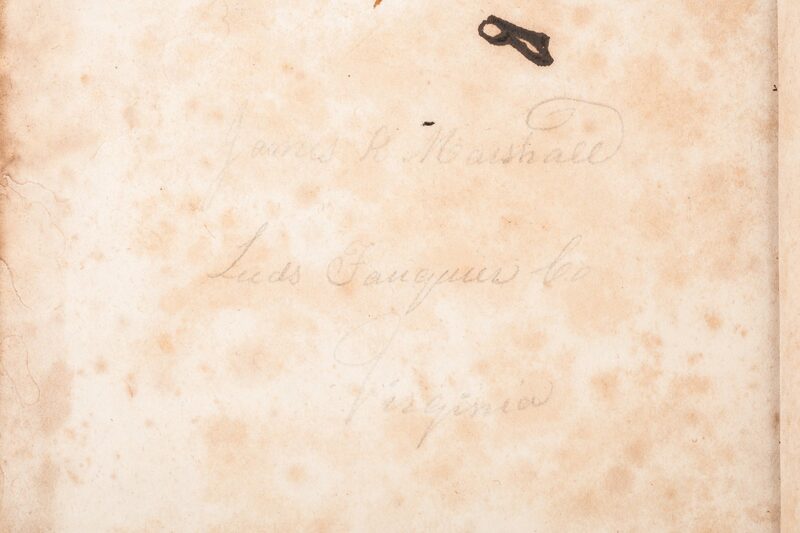 Provenance: The Estate of Charles Boyd Coleman, Jr., Chattanooga, TN, by descent from Lewis Minor Coleman, Jr., son of CSA Lt. Col. Lewis M. Coleman and Mary Ambler Marshall, daughter of James K. Marshall and granddaughter of John Marshall (1755-1835). 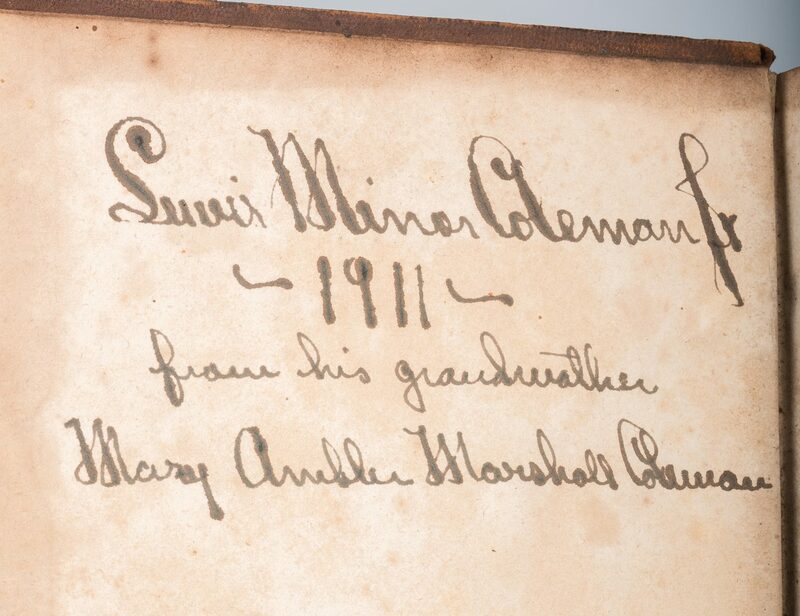 Lewis M. Coleman Jr. was also related to the family of Henry Dearborn by his marriage to Julia Wingate Boyd, daughter of Annette Maria Dearborn Boyd, who was the daughter of Greenleaf Dearborn (1786-1846) and great granddaughter of Henry Dearborn (1751-1829) on her mother's side. 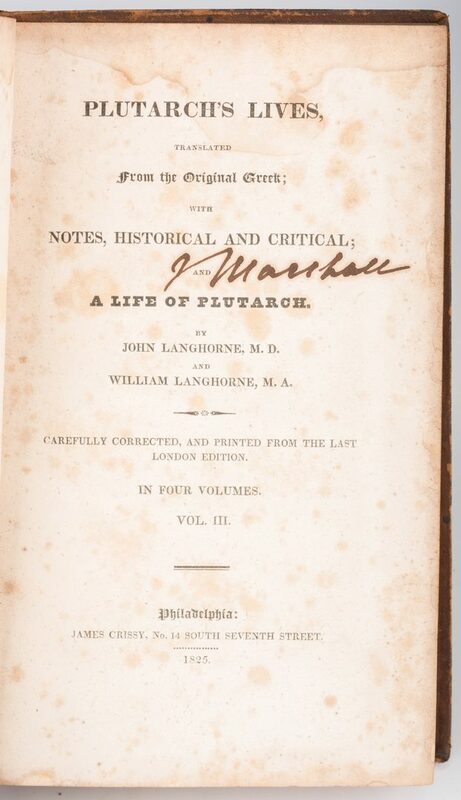 American politican John Marshall was the fourth Chief Justice of the United States Supreme Court, serving for thirty-five years. 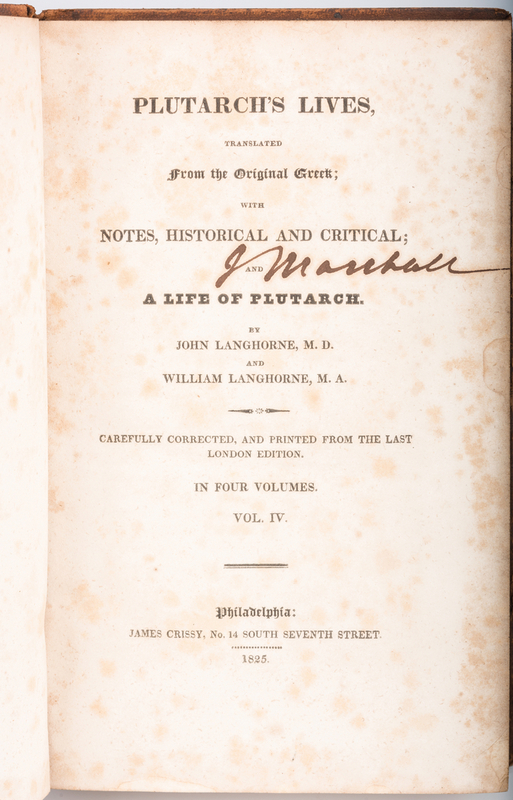 He oversaw landmark decisions such as Marbury v. Madison, McCulloch v. Maryland, Gibbons v. Ogden and the Dartmouth College case. 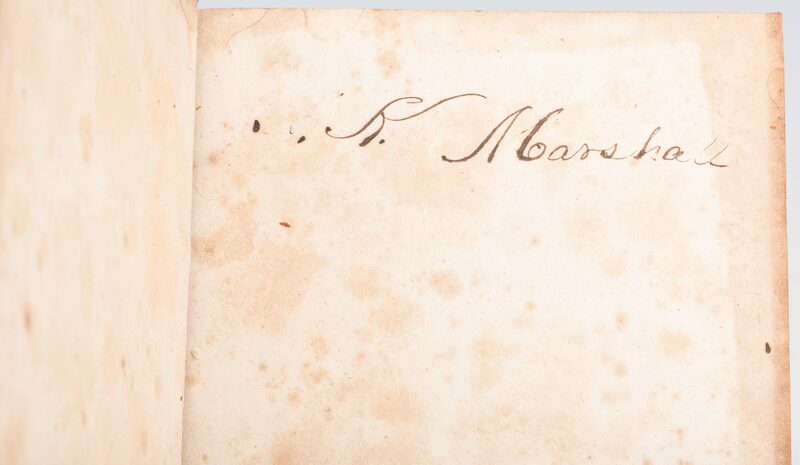 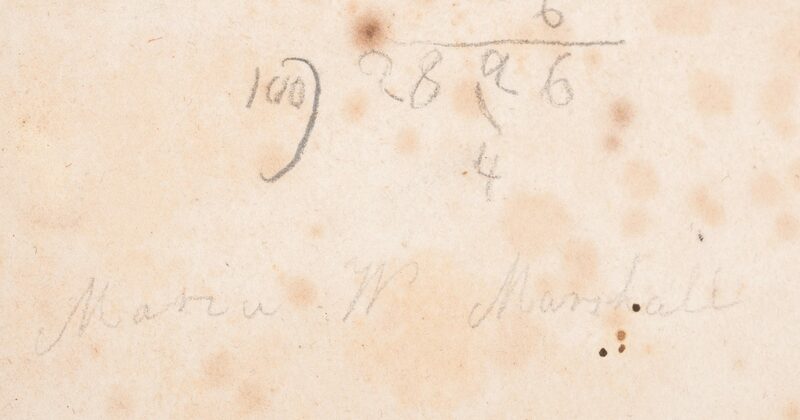 Marshall also was a friend and attorney to George Washington, and was one of the first President's early biographers (see related lot, #263 in this auction). 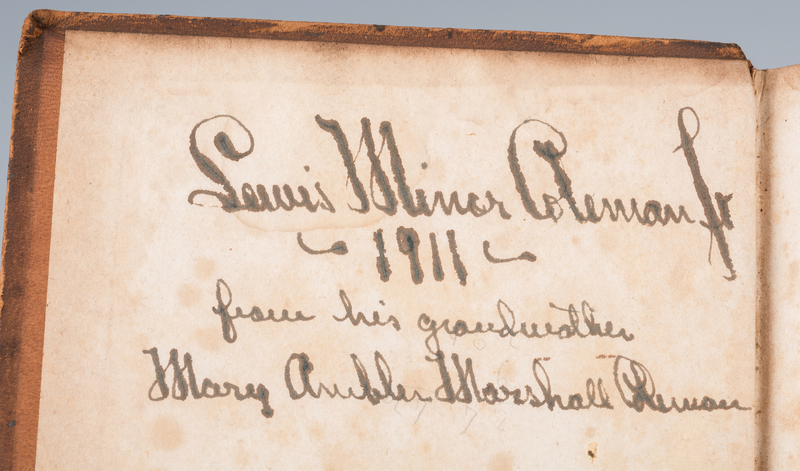 Description courtesy of Stuart Lutz Historic Documents, Inc. 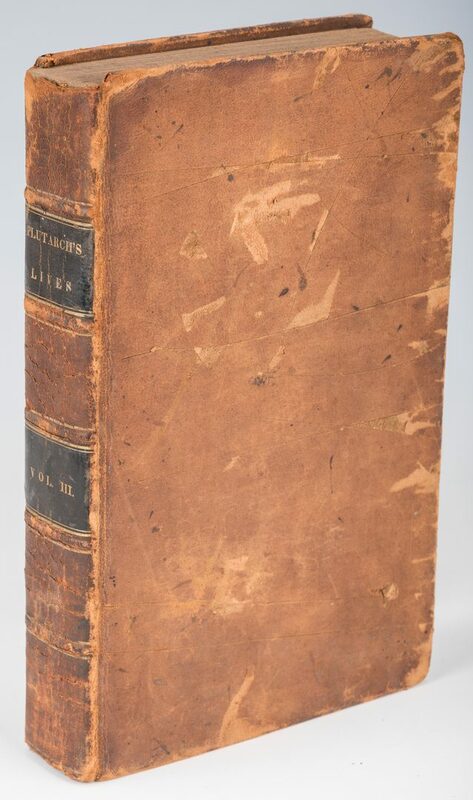 CONDITION: Wear and losses to covers, especially to Volume IV. 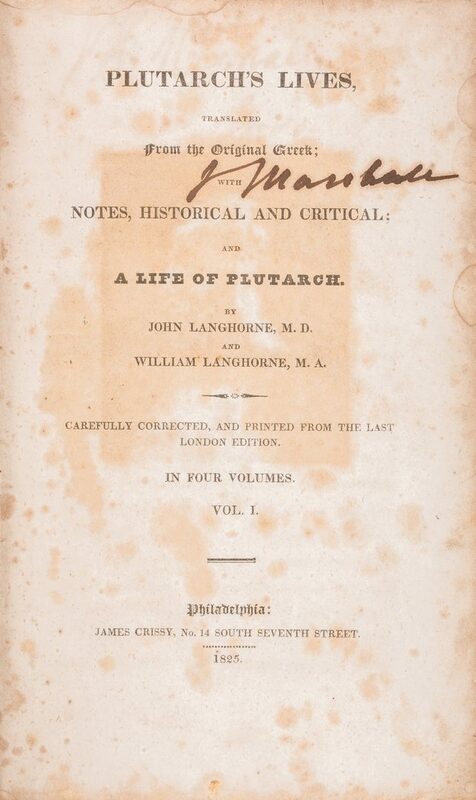 Interiors with scattered foxing, toning and some dampstaining to all volumes. 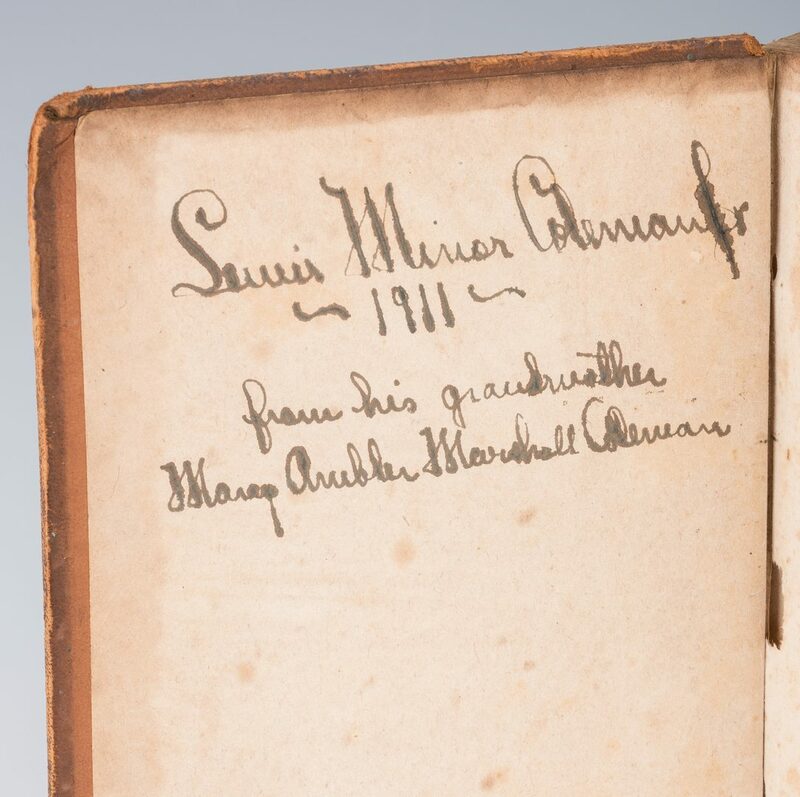 Inscriptions and signatures clean and crisp. 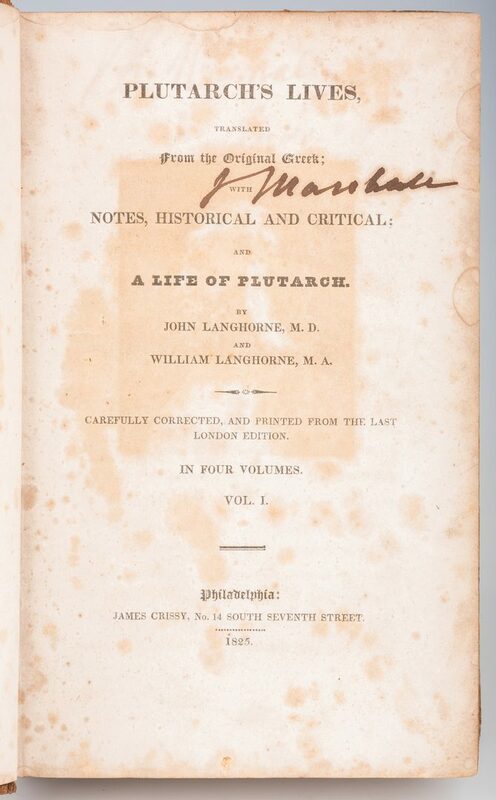 Volumes II & III with pencil doodles and marks to the back free papers. 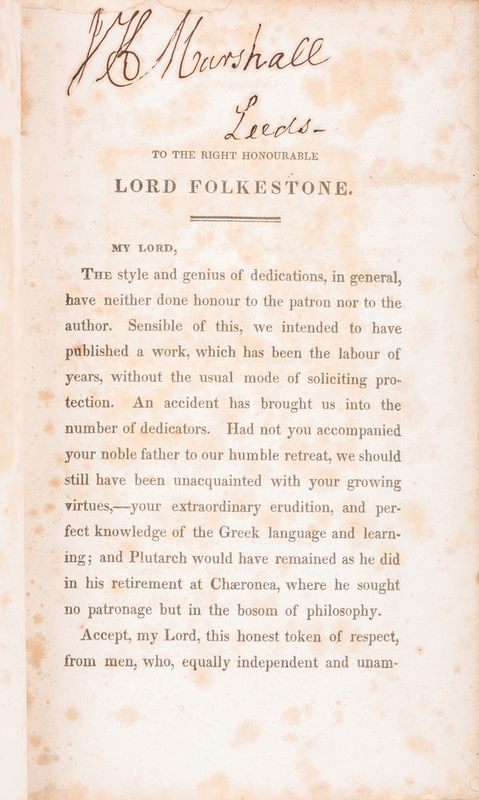 The calf is rubbed and scratched. 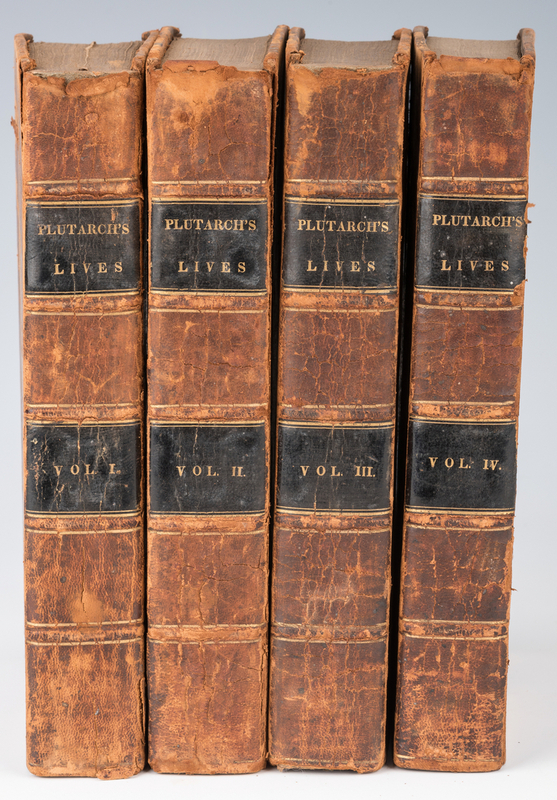 A fine set.